It seems that predictions by some experts in the past are coming to life. 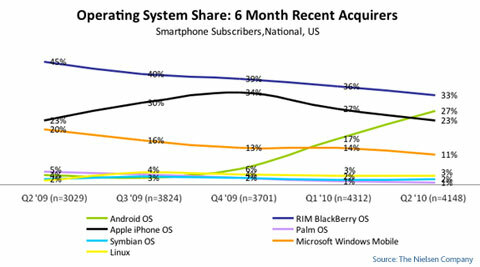 According to statistics released by Nielsen, smartphones using the Android OS are being used by more people than iPhones. They released the following graphs, which were published by The New York Times yesterday. 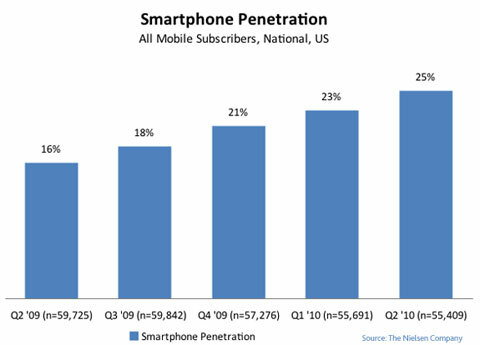 By the end of 2011, there could be more smartphones in the United States than the less advanced feature phones, according to a report released Monday by the Nielsen Company, a market trends monitor. The report also notes that the Google Android platform continues to show rapid growth and over the past six months has edged past the Apple iPhone platform with new subscribers. As the report said, though, in spite of these numbers, it seems that the iPhone is still more sought after than any other kind of mobile phone in the market. The brand and the hype look to be stronger assets than any other set of features out there. Indeed, other stats point to more people switching to the iPhone in the future. However, the fact that this handset is tied to a single carrier just might contribute to declining sales. Do you think this is the beginning of the end for the iPhone? Are Android phones really better?